Angelique Lilas is one of Guerlain's two entries for 2007 to the Aqua Allegoria line, the other being Mandarine Basilic. As I said in last year's review of Tutti Kiwi, the Aqua Allegoria fragrances tend to be lighter, younger and simpler in composition than those in the regular line, and they are basically limited editions: if they do well, they hang around, but otherwise they hit the chopping block in short order. 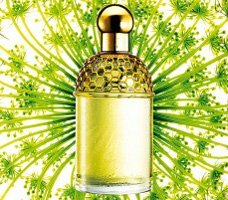 Older Aqua Allegorias currently in production, according to the Guerlain website, include Tutti Kiwi, Grosellina, Pivoine Magnifica, Herba Fresca and Pamplelune. Angelique Lilas is an "aromatic floral" attributed to perfumer Jean Paul Guerlain, and features notes of pink pepper, jasmine, bigarade, angelica, lilac, ylang ylang, cedar and heliotrope. It starts with fruity citrus notes, and the opening is simultaneously sharp, sweet and fresh: it reminds me of orange soda, fruit candy and citrus dryer sheets. Peppered floral notes join in fairly quickly, then it softens dramatically over the next 20 minutes; eventually, it is a rather demure blend of lightly powdered lilac with mild undertones of angelica (angelica fans may be disappointed) over a pale woody-musky base. The ylang keeps it fairly sweet, but it is soft enough that the overall effect is not at all cloying or heavy. It is a pretty enough spring-time floral, but I was hoping for something with a bit more oomph and a bit less dryer sheet. For my tastes, the last winner from the Aqua Allegoria line was 2004's Anisia Bella, now long discontinued. I have not yet smelled Mandarine Basilic, and am holding out hope that it will be the sparkling summer orange that Orange Magnifica was not. Guerlain Angelique Lilas is available in 75 ml or 100 ml Eau de Toilette. Have a favorite Aqua Allegoria? Do comment. Pamplelune… until it started smelling a bit like onions in the dry down. I love Guerlain, but somehow I don't think the AA line is for me. My fave is definitely Pamplelune – I know you hate it, R, and it's certainly a love-it-or-hate-it type. Grapefruit is just one of those notes that really *works* on me, everybody seems to agree (me, my husband, SAs, etc.) I have citrus-amplifying/beautifying skin, which is kind of odd, because I was never a hesperidia wearer or fan before I became a perfume freak. I do like Anisia Bella second best, though. I think the most recent ones have been terrible. LOL — see the comment above. I adore grapefruit, but this one just does horrible things on my skin. I'll stick with PdN Balle de Match. My 2nd favorite AA is Herba Fresca. I never even smelled last year's Grosellina, but thought Tutti Kiwi, while “not me”, was better than the 2005 Magnifica things. Ah, you see, I tried the Grosselina, but not the Tutti Kiwi (scared off by the name)- will have to remedy that. Some people seem to like the Winter Delice – one of the older ones I think? It smells like a light, fresh aldehydic floral with the floral part even more abstract than usual. It is green and a bit sour, a bit spicy. It is often called metallic, which does point to its overtly synthetic vibe but I don't find it quite metallic — this will sound weird, but it reminds me of the smell of hot light bulbs. Or green herbs on a hot light bulb. But the scent itself is cool, not warm. Base is woods & vetiver. Ok, made a hash of that description — I'll have to review it soon! It is actually very wearable & summery. And should have added: doubt you'll love Tutti Kiwi, I just thought it was fun enough, and the Magnificas I thought were particularly dull. Oh lordy…another bois de miel moment??? LOL! On me too! One of those fragrances that is so powerfully, hilariously wrong on me that it's clear (as you said) it must smell different on other people. I really like Winter Delice a lot, which I think is an AA. I tried this last week. The lilac note was very nice, but the top notes were much too fruity for my liking. My favorite Aqua Allegoria is the discontinued Winter Delice. Don't want dryer sheets I probably won't even try this one now, thank you, R! The two new Aqua Allegorias will likely appeal to those who wear Jessica McLintock and Gucci Envy. I tried both at our spring Guerlain school. They are much more delicate than the plethora of fruity florals flooding the market. For those who miss Lilia Bella, Angelique-Lilas might be a good alternative. I think it is wonderful that M. Jean-Paul still has his nose in the business, even though he is semi-retired. Meant as body sprays, the Allegorias have the tenacity of an eau de parfum. Upon revisiting Lavande Velours years back, I realized what incredible depth this unique creation had. I'm glad so many liked Winter Delice. I am not a fan of vanilla in fragrances; I prefer the aquatics that you don't. We're all so different in our tastes but that's what makes the perfume world go round! Oops, miel des bois, that's right. See, I blocked out that cat pee smell to the point that I changed the name. But I vaguely recall that you were actually one of the few amongst us who liked it. Winter Delice was a great scent, and maybe the only AA that I ever thought verged on too strong. I love the sound of Guerlain school! I'm not sure what it is but I know I want to go!. I tend to ignore these perfumes as there seem to be a lot, and I never really understood their place in the Guerlain family as they aren't sold everywhere. I like the idea of them being body sprays though….. much, much more chic than 'Impulse'. I have not found many of the recent AAs to have the tenacity of EdPs, but would certainly agree that they are more delicate than most of the fruity florals out there. Lilia Bella might be about the only AA I haven't managed to try yet — will have to run some down. I am pretty sure that is SA training. I would say their place in the Guerlain family is that they are an attempt to interest a younger audience that wouldn't normally stop by the Guerlain counter. In the US, they are usually at Sephora, and usually not at Guerlain counters in malls. Don't know how it is in other countries though. I will definitely try this one as I am a Lilac fanatic, although the description of the Lilac as powdery is a bit disappointing. I'm constantly on a quest to find a fresh smelling Lilac! I'm hoping this one my be a good substitute for my beloved and discontinued Lilia Bella. The Guerlain SA said this one isn't due to arrive in Vancouver until June. I'd love to try Grosselina, but unfortunately it never seemed to make its way to any of the perfume counters in Canada. Red currant is one of the few fruits I can tolerate in perfume due to its fresh zingy nature. I see loads of them in discount stores like TJ Hughes, and maybe the odd couple on counters, probably the newest ones. I think I will give them a try, they might be perfect for summer! Can I please ask a question, off the subject? Is Thierry Mugler launching a new perfume called 'Aura'? I haven't had a chance to try this yet, but was intrigued because it was a lilac scent, and a lilac scent by Guerlain, at that…unfortunately, though, it sounds as if the lilac sort of plays second fiddle. I, too, have been on the hunt for a true, fresh lilac fragrance where lilac is the predominant note…does anyone know of one??? I would not say the lilac plays second fiddle so much as the angelica, still, nor would I describe it as a true fresh lilac. Have you tried Frederic Malle En Passant? That is my favorite lilac. Others worth trying: Alfred Sung Sha (discontinued, not sure how easy it is to find), Patou Vacances, Ineke After My Own Heart, Elizabeth W Lilac. The new Salvador Dali Purplelight is supposed to be “about” lilac, but haven't smelled it. PS Just us whispering to each other. Did you hate Hampton Sun as much as I did? Here's another vote for Winter Delice, the only AA I still own. I know what you mean about its being almost too strong: it's the only AA that really packs a punch. Such a great cold-weather scent. I thought Mentafollia and Anisia Bella sounded like they'd be right up my alley, but I found Mentafollia insipid and palely floral rather than minty, and from what I've read, Anisia Bella would have been more of the same. (I love anise scents; this doesn't sound like one for me. I guess it's just as well that it was discontinued.) And to be honest, I haven't really liked any of the AAs I've tried in the past few years. I guess it was a passing fancy. Still, there are those three wonderful scents that came out of the line, so that's something. I didn't exactly hate Privet Bloom — just thought it was, you know, meh. Fresh & pleasant, not particularly interesting, and couldn't think of enough other words to say about it to fill a review. Just went and looked at your review — and the top was sharp, but didn't find it that powerful once it dried down — it got kind of aqueous/ozonic/cucumbery and I found it pretty innocuous. LOVED the cardboard spray samples though — easy to mail, but not so useless as the bubble on cardboard or the even nastier towlette thingies. Unless I'm forgetting something, haven't seen those kinds of samples before. Would agree on Mentafollia as palely floral (still puzzled why they put out a less interesting variation on Herba Fresca) but adored Anisia Bella so must stick up for it: it had much more presence. Not so much as Winter Delice, mind you, but it wasn't nearly as dull as some of the others they've done recently. The powder is light, so hoping it won't bother you. I don't understand how the distribution of the AAs works. It seems like every year, one of them shows up at Sephora long before the other, and then the one that lagged behind is only there for a very short time. I know I finally saw Grosellina there months after Tutti Kiwi had launched, but didn't try it that trip and next time I was there, it was gone. Thanks for your suggestions- I didn't even know those frags featured lilac (except for the Elizabeth W., but only because it's in the name, lol) I will definitely try to check them out! Perhaps part of the reason I have never found a lilac scent I adore is because, from what I understand, it's one of those flowers from which the natural essence can't be extracted- like many others, it must be recreated with synthetics. Not that I have anything against that- but it may explain why nothing seems to capture the true essence of a lilac tree in bloom for me. Oh, and wanted to add my two cents as far as my fave AA goes…no one has mentioned Lemon Fresca! I unfortunately haven't had a chance to try even half of the AA's, but of the ones I have, Lemon Fresca was, to me, exactly the way one wants to smell in summer…reminded me very much of the other Guerlain eaux (Eau de Guerlain, Eau de Fleurs de Cedrat, Eau du Coq, etc.) but more directly lemon-y, without veering into Lemon Pledge territory. Very well done, I thought. Mentafolia is my favorite! Something about how the mint and rose work so gently together. Couldn't stand Herba Fresca, makes my throat itchy. Flora Nerolia is my 2nd fav, smells just like a sunny citrus grove in bloom. Lilia Bella would be my 3rd fav. Am going to seek out the Mandarine Basilic, that one sounds right up my alley. Winter Delice was/is (I have a back-up bottle) my favourite, along with Lavande Velours, one of the very first AAs, which captured the demure/naughty double nature of lavender so well….. I quite liked Pamplelune but didn't wear it often – it was so upbeat it depressed me, rather like people who sing arias under the shower and talk happily and incessantly early in the morning, when all you want is to suffer quietly over your coffee cup because getting up early just is SO not you…. Pamplelune again:) It really doesn't smell like cat's pee on me, but I can imagine it does on others, with this bitter-sour note. It surely smells nasty on most of my friends. Yet I love this beautiful grapefruit and Pamplelune is one of my favourite summer fragrances, for these hot days my beloved orientals just don't fit. As for Angelique Lilas, I kinda like it, but there's too much lilac and too little angelique (same as Mandarin Basilic – too much mandarine and too little basilic for me). I could use it, but I won't buy it. I'm afraid I can hardly remember Lemon Fresca, only tried it once and a long time ago. Sorry your favorite got discontinued! The Frederic Malle does not capture “true lilac” in that way. Going on memory, Sha was closer, but I haven't smelled it in a couple of years so wouldn't swear to it. LOL — many people compared Herba Fresca to bug spray, so it all depends on your personal taste. I never smelled Lavande Velours — will have to see if decants are still floating around. Welcome! And oh no, was Mandarine Basilic dull?? I can live with minimal basil if the orange is very sparkling and juicy, and if it has even halfway decent lasting power. Really good orange scents are so rare. I wouldn't say it's dull but well… Oh, let's say it's not a masterpiece but it is just 'nice' for me, nothing more, nothing less. Orange, mandarine and grapefruit notes are strong, nice and yes, juicy I would say. But I was hoping for this basil and now I'm a little bit disappointed with it. But it is still worth trying. OK. Not expecting a masterpiece from an AA, but going to try to remain hopeful, LOL…thanks! Baby Jane: to answer your question about school, twice a year the Guerlain beauty advisors and demonstrators go to a 2 day school to learn about the new products for the coming 6 months. It was the great Roja Dove who advocated the use of EDT's as body sprays with just a dab of extract (pure perfume). The AA's seem to work best as an after bath spritz of freshness. And yes, some have more tenacity than others. We found that Flora Nerolia appealed to a specific ethnic group, which we found was an interesting characteristic. Maybe it was the incense in the drydown. Pamplelune smells extraordinary on my rep whose skin is light brown. The new AA's are due to arrive in Vancouver by mid-June but have been requested to come sooner. We'll see. Distribution does vary greatly as the decision as to who gets what is made at head office. Last year Grosellina and Tutti Kiwi were available at the Toronto Boutique, some years we don't get any AA's out west (we missed Anisia Bella and Mentafolia), and other years we get two. Thank you, Robin, for including information as to where one can buy other companies' fragrances in Canada. Hah hah! Cat pee! How marvelous that context can create the experience of a scent. I was in the kitchen, and suddenly a wafting aroma made me looked at the dogs like, which one of you critters-who-don't-value-their-lives yakked or peed and where?! It turned out to be a bowl of wild mushroom sitting on the counter waiting to be cooked. LOL! And hey, can I come over for dinner? I've been meaning to try the ones listed above as well – particularly En Passant. I've also heard wonderful things about Ineke's After My Own Heart. You might be able to purchase Sha online, but I sniffed it a few years ago, and found it extremely artificial smelling (almost like bathroom cleaner). Another one I'm anxious to try is called Highland Lilac (www.highlandlilac.com). It's produced in Rochester New York, which has one of the biggest annual lilac festivals in the world. It is apparently produced somehow from freshly harvested lilacs, and is a soliflore. Finally, if you're into lilac soaps, I highly recommend Pacifica's French Lilac. It is a blend that recreates the scent of lilac, but is one of the truest fragrances I've smelled. One bar scents my whole bathroom! They also have a matching body butter which smells lovely too. Just thought I'd pass this on, 'cause I'm a Lilac fanatic, and nice fragrances are really hard to find! Heh, anytime! Big hugs BTW, hugs & pinches. Makes me all fuzzy wuzzy and teary that I actually have a comment after 6 months of not writing.